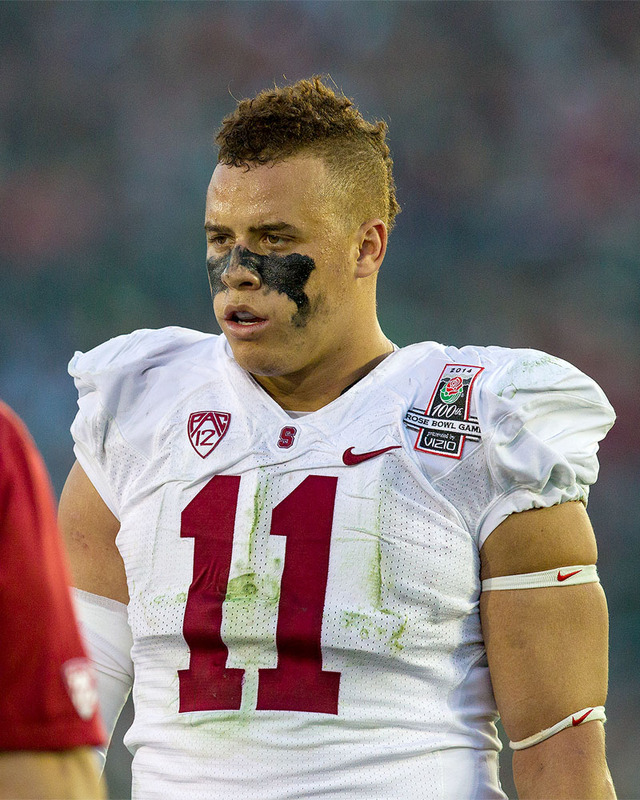 In this past weekend’s NFL Draft, many people were surprised when guard David Yankey dropped to the fifth round, but even more were stunned when inside linebacker Shayne Skov went undrafted and ultimately ended up signing as an undrafted free agent with the San Francisco 49ers. In the wake of those proceedings, we asked football writers Michael Peterson, Vihan Lakshman and David Cohn: Why did Stanford’s players fall so low? Michael: The common theme for Yankey and Skov — and even Tyler Gaffney, who suffered a little bit of a fall of his own in regards to the NFL Draft — was questions about athleticism. With Yankey, scouts worried that he wasn’t strong enough or quick enough to be able to consistently deal with NFL-caliber defensive linemen. For Skov, NFL teams still wondered whether or not his ACL/MCL injuries have had lingering effects on his speed and explosiveness. And for Gaffney, even after posting a 4.46 40-yard dash time, ESPN analyst Bill Polian said that Gaffney doesn’t have “big speed,” echoing a sentiment seemingly felt by all the teams who passed over Gaffney in the fifth and sixth rounds. On the other hand, Trent Murphy, Cameron Fleming and Ben Gardner, the three Stanford players who were drafted around when they were projected to go, performed rather well in traditional combine and pro day tests that scouts use to evaluate players — Murphy and Fleming impressing with their strength and Gardner with his overall athleticism. While the concerns barring the former trio don’t seem completely valid in my opinion, they were enough for teams to question whether Yankey or Skov could live up to their billing. The consequence, if anything, is to put a chip on the shoulders of Yankey and Skov, which I fully expect to see them each use to their advantage in their futures in the NFL. Vihan: I think Michael hit the nail on the head: NFL scouts seemed to rely heavily on raw measurables in this draft and several Stanford players did not post the numbers they were expected to. As evidence, consider the example of Gardner, one of the positive Stanford stories from the weekend. Although initially projected to go undrafted after tearing his pectoral muscle midseason, Gardner wowed NFL teams in his only pre-draft workout at Stanford’s pro day — posting a 39.5-inch vertical leap, the highest out of any participant. Afterwards, Gardner’s draft stock shot up considerably, ultimately leading to a seventh-round selection. On the other hand, Skov was reportedly hampered by a hamstring injury all throughout the pre-draft process and did not run at the NFL Combine. Add in the lingering knee concerns, and teams seemed willing to look past the fact that he’s the leading tackler on one of the top defenses in the country. The same appears true for Yankey, a two-time All-American and undisputed leader of one of the best offensive lines in the country. His perceived slow footwork and lack of athleticism seem to have carried more weight with scouts than his on-field production. Another possible reason for the falling draft stock of so many Stanford prospects could be a residual effect of the Jonathan Martin incident in Miami this past season. Although this is pure speculation, it is not inconceivable that some NFL front offices felt trepidation about drafting a Stanford player and were perhaps worried that Cardinal prospects could not handle the culture of the NFL. Nonetheless, the draft does not necessarily seal a player’s fate and almost all Stanford prospects have been given a chance to compete and earn a spot on an NFL roster — an opportunity they will surely look to maximize. David: I agree with Michael and Vihan in that several factors certainly contributed to this phenomenon. I certainly believe that some general managers and NFL executives attached the “system” label to players such as Gaffney and Skov; more specifically, these NFL officials could have attributed some of Gaffney’s and Skov’s success to the effectiveness of Stanford’s system and schemes rather than either player’s raw ability. As such, it is clear that general managers value height, weight, speed and other athletic metrics as better indicators of potential at the next level than production in college. Skov certainly was also not helped by the fact that he missed the combine due to injury, and that his 5.1-second 40-time came while he was still dealing with the lingering effects of his calf injury. Finally, I think this example provides ample evidence that while ESPN, CBS.com or even NFL.com analysts may try their best to predict the results of the upcoming draft, sometimes it is impossible to predict what NFL executives will ultimately decide to do. Despite the disappointments of having many Cardinal players fall below their projections, Michael Peterson, Vihan Lakshman and David Cohn are even more surprised that the Stanford Tree remains an undrafted free agent. Tell them to apply to be the Tree’s agent at mrpeters ‘at’ stanford.edu, vihan ‘at’ stanford.edu and dmcohn ‘at’ stanford.edu.